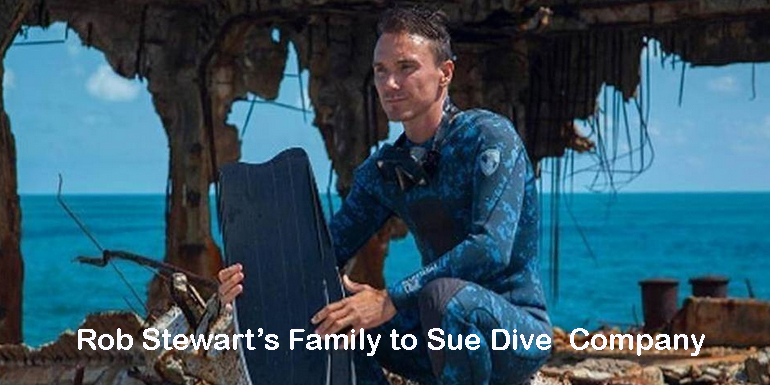 Famed Canadian documentary filmmaker and conservationist Rob Stewart died from drowning after succumbing to acute lack of oxygen — or hypoxia — at the surface of the ocean in late January, according to a Monroe County medical examiner’s report obtained by The Reporter/Keynoter. Stewart, 37, died while filming the next installment of his “Sharkwater” documentary films. He disappeared beneath the waves after surfacing from his third deep dive on the Queen of Nassau wreck about five miles offshore of Islamorada on Jan. 31. He emerged from the 220-foot depths with his dive partner that day, Peter Sotis. Sotis, who provided the advanced rebreather dive equipment both men used, boarded the Pisces dive boat, owned by Horizon Dive Adventures, and “immediately had a medical event” on the vessel’s deck, Beaver wrote. But while the Pisces crew attended to Sotis, no one noticed Stewart slip beneath the waves. A three-day, multi-agency, massive air and sea search ensued, but in the end, Stewart’s body was found Feb. 3 more than 220 feet below at almost the exact spot he was last seen. The Key Largo Volunteer Fire Department’s dive team was given credit for finding the body, but it was actually found by a crew aboard the Key Largo-based Pisces, with the fire department providing “support staff,” Beaver wrote. Sotis also trained Stewart on diving with the rebreathers. Beaver concluded that since Sotis and Stewart were using the same types of rebreathers with the same gas mixtures, they likely suffered the same condition. Both men ascended from their dives at rates that “exceeded standards,” but Beaver ruled out decompression sickness, caused by the formation of nitrogen gas bubbles in the body when coming up to the surface too fast. Beaver justifies his opinion by noting Sotis recovered right after being treated with oxygen, and oxygen alone “does nothing to address the underlying pathophysiology of” decompression sickness. In March, Stewart’s family filed a wrongful death lawsuit in Broward County Circuit Court against Horizon and Sotis’ company, Add Helium, LLC. Michael A. Haggard, an attorney for the Stewart family, said this week that the autopsy bolsters his clients’ case against Sotis and Horizon.